When I was growing up, Russian Cabbage Rolls – Golubtsi (Голубцы) were one of my favorite meals. Ground meat mixed with onions, rice, carrots and spices, rolled up in cabbage leaves then cooked in a tomato sauce. Sometimes mum would make a tray and pop it into the freezer, then pull it out and cook a quick tasty meal. Making a Cabbage Rolls recipe does take time to make, but there is a quicker version called Lazy Cabbage Rolls, if you’re in a hurry. I find it tastes the same, but takes so much quicker to make, almost like a stew. I love both versions, my kids love this original recipe in a dutch oven or stock pot. Cabbage Rolls are a classic Eastern European meal. A traditional Cabbage Rolls recipe isn’t usually made with layers of bacon, I added that goodness into my recipe. In Poland, they’re called golabki, in Ukraine they’re called holubtsi, Serbs and Croats call them sarma, Hungarians call them töltött káposzta and even the Swedes call them kåldolma. The list goes on, as its very popular across many cultures. The whole family can help make this Russian Cabbage Rolls recipe – Golubtsi Layered with Bacon, even the kids, as it’s not hard to roll cabbage and meat. They are delicious, economical and can feed an army of people. What’s not to love about this dish! I’m not a big pork eater (except for bacon which isn’t really pork, right?) Many people use pork for the filling, but I use ground beef, mixed with fried onions and carrots and cooked rice, wrapped inside individual cabbage leaves. My mum always used a baking tray, or lasagna tray to make her cabbage rolls. 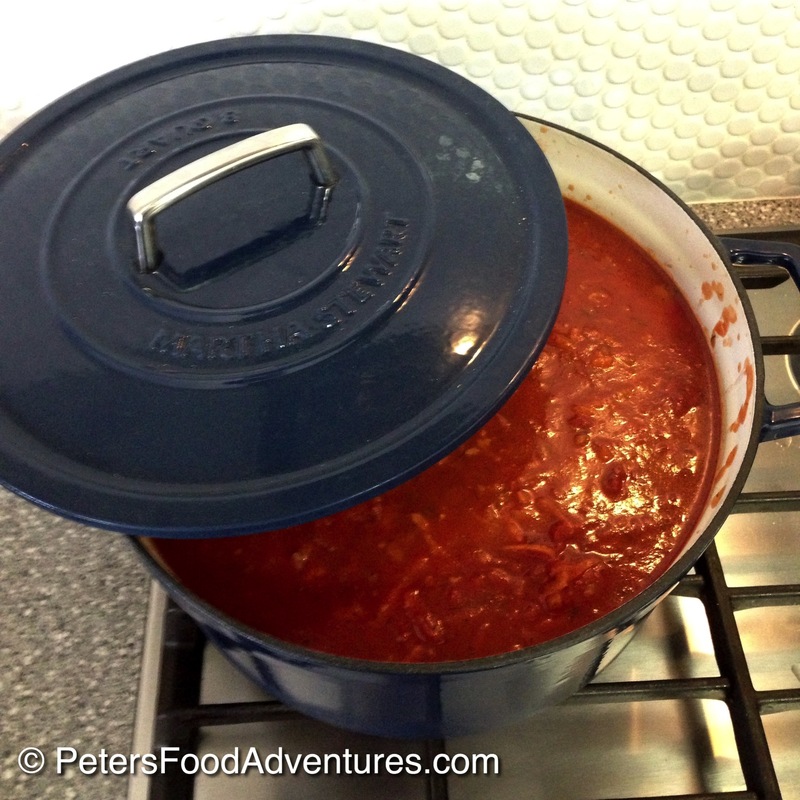 I use a 8 Quart Martha Stewart Cast Iron Round Pot which works perfectly (and feeds more people). Layer the cabbage leaves tightly in the pot in a single layer, then cover it with a row of bacon, then repeat. I can usually get 3 levels of cabbage rolls and bacon, then pour a tomato sauce (Podlivka) over it all and let it simmer! I also think my Podlivka sauce is pretty special. Some people use plain water with some tomato paste, others use beef stock, or add water with a tin of tomatoes. While that can work, I find it’s more flavorful, and nutritious to use Passata sauce. Passata is simply pure uncooked tomatoes that have their skins and seeds removed. It’s an uncooked tomato puree. I find this is the secret to a delicious and flavorful golubtsi. It’s in the sauce!!!! This Cabbage Rolls recipe – Golubtsi Layered with Bacon will be the best cabbage rolls you have ever had and worth the effort! Enjoy with a generous dollop of sour cream and fresh dill for garnish. Bon Appetit! Приятного аппетита! Rinse the rice, and cook according to instructions, and allow to cool. Cut out the core from the cabbage and remove the outer leaves. In a large pot of salted water, fully submerge the cabbage, core side down. Bring to a boil and rotate the cabbage (allowing water to fill through the core between the leaves). After about 6-7 minutes, pull off the cabbage leaves as they soften, and allow to cool. Leaves should be soft enough to bend but not overcooked. In a frying pan, heat olive oil and sauté 2 onions until caramelized then add 3 grated carrots for 7 minutes until caramelized. In a large bowl, mix together ground beef, cooked rice, sautéed carrots and onions, 2 eggs, salt and pepper and mix well. Place 2 tablespoons of meat mixture to the thickest side of the cabbage leaf. Roll up the cabbage, tucking the insides as you go, wrapping as you would a burrito. Your first few might look a bit funny, but it will get easier as you go. 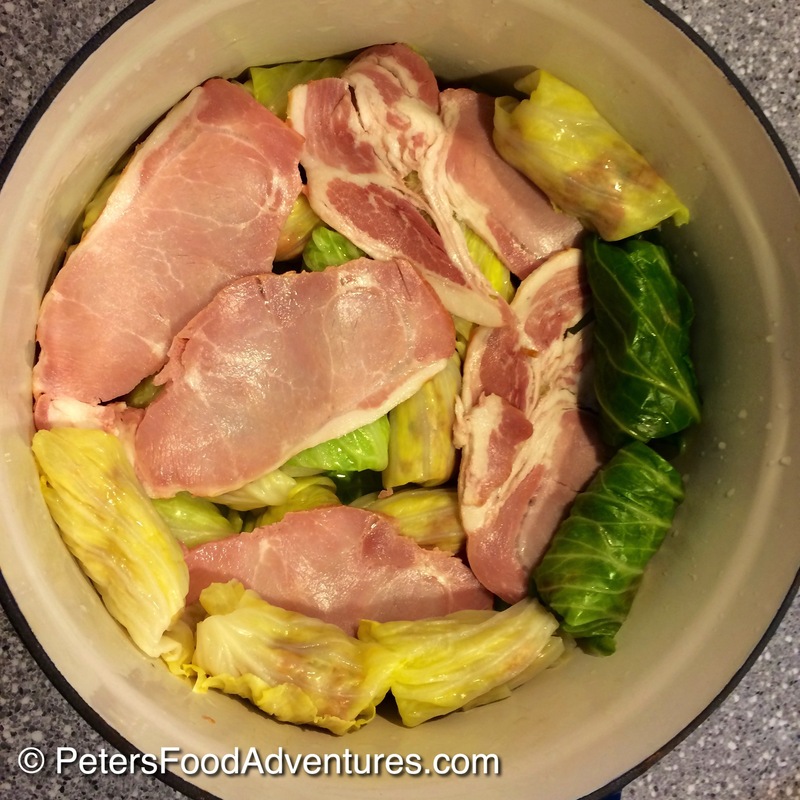 Layer a few cabbage leaves in the bottom of your Dutch Oven Pot. Lay the cabbage rolls side by side until the first layer is filled. Place a layer of bacon on the cabbage rolls. Repeat levels until pot is full, I usually get 3 levels. In a separate pot, add 1 tablespoon of oil over medium heat and sauté the remaining onion, garlic and carrots until tender. Add the 2 bottles of Passata tomato puree, bay leaves, chopped cabbage leaf leftovers, beef stock powder and bring to a boil. Remove from heat, add sour cream and chopped dill and mix through the tomato sauce. Add Maggi (optional) and season with salt and pepper to taste. Pour the tomato sauce over the cabbage rolls and bacon until fully covered. Bring it to a simmer, cover and cook for approx. 40 minutes until the meat is throughly cooked. Serve with sour cream, garnish with dill and enjoy! The centre pieces of the cabbage are too small to use, as are any thick stems. Finely chop them and any excess cabbage and reserve for the tomato sauce.